Edward Mahon was a real estate broker and developer. It appears that he was staying temporarily in David Wilson’s house at 1966 Haro Street in 1914. Edward Mahon was born on June 11, 1862, in Rawmarsh, Yorkshire. He was the sixth son of Reverend Sir William Vesey Ross Mahon (1813-1893), an Irish baronet who was living in England. The family home was Castlegar, County Galway, Ireland. Evening Telegraph and Star and Sheffield Daily Times (Sheffield, England), ; Issue 1926, August 14, 1893; page 3. “Ireland Calendar of Wills and Administrations, 1858-1920,” database with images, FamilySearch (https://familysearch.org/ark:/61903/1:1:KZ5Z-WJT : accessed 27 March 2016), William Vesey Ross Mahon, 14 Aug 1893; citing 00256, 005014907, Principal Probate Registry, Dublin; 100,993. Edward’s mother was Jane King (1826-1895). 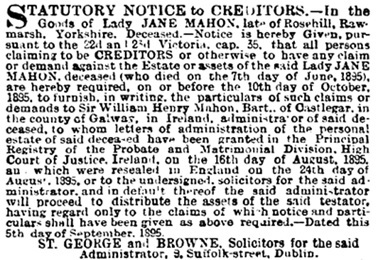 Lady Jane Mahon, Statutory Notice to Creditors, The Standard (London, England), September 10, 1895, page 1. Edward went to school at Marlborough College in Wiltshire. This school was founded in 1843 for the sons of Church of England clergy. 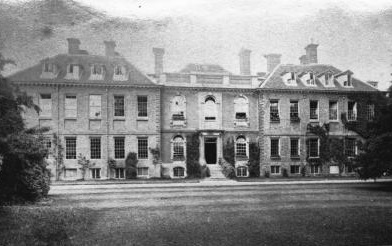 Marlborough College, Marlborough, 1889, Wiltshire Community History, http://history.wiltshire.gov.uk/community/getimage.php?id=729. Edward later studied at Exeter College at the University of Oxford. 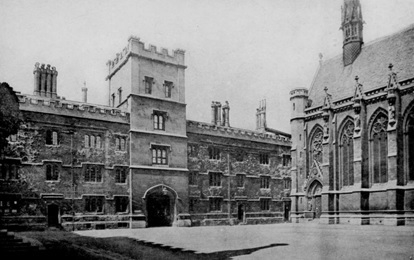 Exeter College, 1903. Source: Alden’s Oxford Guide, Internet Archive and St. Michael’s College Toronto; http://www.victorianweb.org/art/architecture/oxford/exeter/3.html. Edward received a Bachelor of Arts from Oxford in 1884. By 1894, Edward was in Vancouver. 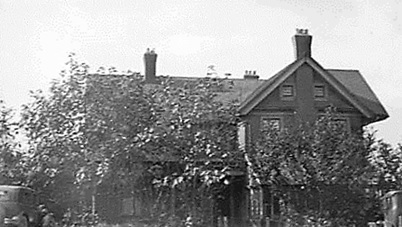 Edward’s main home from 1898 to about 1928 was at the corner of Burrard Street and Seaton Street. (After 1915, Seaton Street was called West Hastings Street). Mahon [house], last house on Burrard [1927? 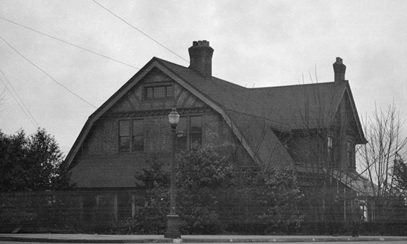 ]; City of Vancouver Archives, CVA 677-964; http://searcharchives.vancouver.ca/mahon-house-last-house-on-burrard. Old House Hastings and Burrard Streets, Jan. 20, 1929; City of Vancouver Archives; CVA 447-296; http://searcharchives.vancouver.ca/old-house-hastings-and-burrard-sts. Background: The Mahon House – Hastings and Burrard; https://changingvancouver.wordpress.com/tag/edward-mahon/. Mahon [house], last house on Burrard [1927? ]; City of Vancouver Archives – CVA 677-956; http://searcharchives.vancouver.ca/mahon-house. 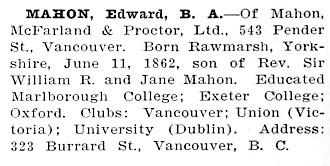 Edward became part of the company called Mahon, MacFarland and Mahon Ltd., which Edward’s brother, John, had founded. Joseph Walter McFarland, who lived at 1865 Haro Street from 1900 to 1937, was another member of the firm. Frederick James Procter, who lived at 1846 Haro Street from 1910 to 1917, later joined the company as a director. In 1910, the business became known as Mahon, McFarland and Proctor Ltd.
Edward was a director of North Vancouver Land and Improvement Co., Ltd., the Great Dominion Land Co. Ltd., the Albion Land Co. Ltd., and the North Shore Press. He had many interests in real property. The North Vancouver Land and Improvement Company was a prominent player in the development of the North Shore of Burrard Inlet. Edward was part of the committee that supported the incorporation of the City of North Vancouver in 1907. Edward belonged to the Vancouver Club, the University Club in Dublin, Ireland, the Union Club in Victoria, and the Jericho Country Club. He also supported tuberculosis treatment facilities, including the sanitorium at Tranquille, near Kamloops, British Columbia. On April 26, 1911, Edward married Lilette Caroline Julia Rebbeck. She was born in Macao, China, on March 20, 1889. Her father was James Knight Rebbeck (1848-1910), a mechanical engineer and naval architect who had lived in India and elsewhere in Asia, including Macao. The Rebbeck family arrived in British Columbia in the early 1890s. They lived in Vancouver briefly, but soon moved to Victoria, where James Rebbeck worked as a manager for the Albion Iron Works, and later as a consulting engineer. James died in Victoria on September 1, 1910. Lilette’s mother was Emelie Caroline Elizabeth d’Abbadie (1863-1935) (often called Elizabeth). A few years before 1911, Edward had invited Lilette to the Vancouver Club’s New Year’s Eve Ball. She did attend, along with a suitable chaperone. Later, despite the difference in their ages, Edward persuaded Lilette to marry him. Because Lilette’s father had died the previous fall, the wedding in Christ Church was fairly quiet. After the wedding, Edward and Lilette travelled to New York and then on to England and continental Europe, including a visit with Edward’s family in England. 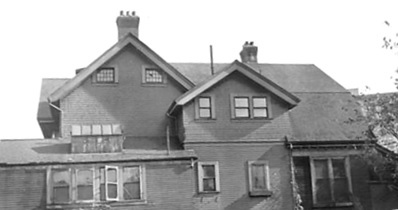 In the late 1920s, Edward and Lilette moved from their house at 323 Burrard Street to 1370 Burnaby Street. The property at 323 Burrard Street became the site of Vancouver’s well-known Marine Building. Lilette was active in education-related activities and in political affairs. She was on the Vancouver School Board from 1930 to 1936. She also ran as a candidate for Vancouver City Council and for the federal Parliament, although she was unsuccessful in both cases. She served as president of the B.C. Parent-Teacher Federation and the Vancouver Parent-Teacher Council. In 1936 she became president of the B.C. School Trustees Association. Edward died in Vancouver on June 18, 1937. Lilette remained in Vancouver for several years. In the 1940s she studied for four years at the Vancouver School of Art. In 1953, Lilette moved to Seattle, Washington. She died in Seattle on April 16, 1956. Edward and Lilette had a son. Bryan worked for Boeing Aircraft of Canada from about 1936 to 1944. In 1945, after the end of the Second World War, he moved to Seattle to work with Boeing’s operations there, specializing in flight test engineering. Bryan died on November 10, 2005, at Mercer Island, Washington State. 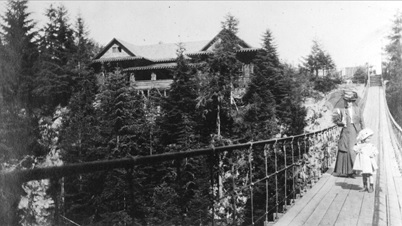 From 1910 to 1935, Edward owned the Capilano Suspension Bridge. Mrs. Buswell and daughter on the Capilano Suspension Bridge, May 24, 1910, Vancouver City Archives, Out P941; http://searcharchives.vancouver.ca/mrs-buswell-and-daughter-on-capilano-suspension-bridge. Archibald Dunerik McEachran, who was born in Scotland in 1897, became involved with the operation of the bridge. He also met Lilette’s mother, Elizabeth. 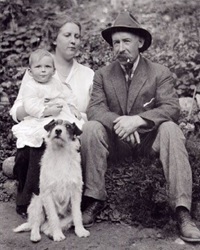 Although Elizabeth was 20 years older than Archibald, they were married in New Westminster on June 20, 1921. It later turned out that Archibald had an uncertain past. By 1934, he had disclosed to Elizabeth that he had a daughter, Irene, sometimes called Jane Anderson McEachran. Elizabeth died in Vancouver on February 12, 1935. She was buried in Ocean View Burial Park in Burnaby, British Columbia. Archibald took over the Capilano Suspension Bridge and remained its proprietor until 1945. Archibald’s brother, Bertram Farmer McEachran (1900-1973), who lived nearby, was the president of B.C. Stamp Works. In 1945, Archibald sold the bridge to Henri Aubeneau, and Archibald moved to California. In 1951, Archibald became a naturalized United States citizen. He was living at 1020 Skyline Drive in Laguna Beach. 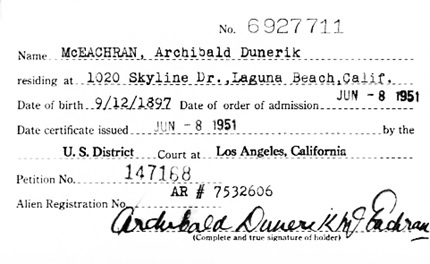 “California, Southern District Court (Central) Naturalization Index, 1915-1976,” database with images, FamilySearch (https://familysearch.org/ark:/61903/1:1:KXQ4-QP6 : accessed 28 March 2016), Archibald Dunerik Mceachran, 1951; citing Los Angeles, Los Angeles, California, United States, National Archives and Records Service, Los Angeles Branch, Laguna Niguel; FHL microfilm 1,570,838. “California, Southern District Court (Central) Naturalization Index, 1915-1976,” database with images, FamilySearch (https://familysearch.org/ark:/61903/1:1:KXQ4-QPF : accessed 28 March 2016), Jane Anderson Mc Eachran, 1951; citing Los Angeles, Los Angeles, California, United States, National Archives and Records Service, Los Angeles Branch, Laguna Niguel; FHL microfilm 1,570,838. In 1954, Archibald and Jane flew on Pan American Airlines from Lisbon, Portugal to Idlewild Airport (later JFK airport) in New York. Also travelling with them was Victoria C. Wilson, who might have been Jane’s daughter. “New York, New York Passenger and Crew Lists, 1909, 1925-1957,” database with images, FamilySearch (https://familysearch.org/ark:/61903/1:1:2H4K-HLH : accessed 28 March 2016), Archibald D Mceachran, 1954; citing Immigration, New York City, New York, United States, NARA microfilm publication T715 (Washington, D.C.: National Archives and Records Administration, n.d.). “New York, New York Passenger and Crew Lists, 1909, 1925-1957,” database with images, FamilySearch (https://familysearch.org/ark:/61903/1:1:2H4K-HLZ : accessed 28 March 2016), Jane A Mceachran, 1954; citing Immigration, New York City, New York, United States, NARA microfilm publication T715 (Washington, D.C.: National Archives and Records Administration, n.d.). Archibald died in Mexico in 1963. He was buried in Forest Lawn Memorial Park in Los Angeles, California. It appears that Jane was married twice, first to a Mr. Wilson, and later to a Mr. Gibson. Jane died on October 21, 1997, in Kern County, California. Walter Volovsek, Trails in Time; http://www.trailsintime.org/html/whatsnew: nature and history trails located in the vicinity of Castlegar B.C., Canada. Includes extensive information and illustrations relating to the Mahon family. Mr. Volovsek also has a Facebook page for Trails in Time: https://www.facebook.com/Trails-in-Time-482315625214141/. Mahon (UK) 1819, of Castlegar, co Galway (name pronounced “Mahn”), Debrett’s Peerage and Baronetage, London, Macmillan, 1995, pageB579. Mahon (UK) 1819, of Castlegar, co Galway (name pronounced “Mahn”), Debrett’s Peerage and Baronetage, London, Macmillan, 2000, pageB685. “England and Wales Census, 1871”, database with images, FamilySearch (https://familysearch.org/ark:/61903/1:1:VBZM-9SH : accessed 27 March 2016), William V Ross Mahon, 1871. “England and Wales Death Registration Index 1837-2007,” database, FamilySearch (https://familysearch.org/ark:/61903/1:1:2J2S-TVY : accessed 27 March 2016), William Vesey R Mahon, 1893; from “England & Wales Deaths, 1837-2006,” database, findmypast (http://www.findmypast.com : 2012); citing Death, Rotherham, Yorkshire, England, General Register Office, Southport, England. “England and Wales Census, 1871”, database with images, FamilySearch (https://familysearch.org/ark:/61903/1:1:VBZM-9SC : accessed 27 March 2016), Jane Mahon in entry for William V Ross Mahon, 1871. “England and Wales Death Registration Index 1837-2007,” database, FamilySearch (https://familysearch.org/ark:/61903/1:1:2JGY-99X : accessed 27 March 2016), Jane Mahon, 1895; from “England & Wales Deaths, 1837-2006,” database, findmypast (http://www.findmypast.com : 2012); citing Death, St. George Hanover Square, London, England, General Register Office, Southport, England. “Ireland Calendar of Wills and Administrations, 1858-1920,” database with images, FamilySearch (https://familysearch.org/ark:/61903/1:1:KZ5Z-5Z5 : accessed 27 March 2016), Lady Jane Mahon, 07 Jun 1895; citing 00257, 005014909, Principal Probate Registry, Dublin; 100,995. The Ambitious City: A History of the City of North Vancouver, by Warren Sommer; Madeira Park, Harbour Publishing Company Limited, British Columbia, 2007, pages 52-53, 63-64, 83, 94, 118,162. [includes photographs of Edward Mahon at pages 52 and 94]. Edward Mahon, Who’s Who in Western Canada, edited by C.W. Parker, Vancouver, Canadian Press Association, 1911, page 256. Edward Mahon, Northern Who’s Who: A Biographical Dictionary of Men and Women, Volume 1; edited by Dr. C.W. Parker; Vancouver, Western Press Association, 1916, page 492; https://archive.org/stream/northernwhoswhob01park#page/492/mode/1up. Edward Mahon, Wikipedia article; https://en.wikipedia.org/wiki/Edward_Mahon. Changing Vancouver, The Mahon House – Hastings and Burrard; August 19, 2013; https://changingvancouver.wordpress.com/tag/edward-mahon/. The Peerage, Edward Mahon, #37292, b. 1 June 1862, d. 18 June 1937; http://www.thepeerage.com/p3730.htm#i37292. “Mahon Exhibit set to open Monday,” Castlegar News, August 9, 2012; http://www.castlegarnews.com/community/165647536.html [includes photograph of Edward Mahon]. “Castlegar named for founder’s Irish family estate,” by Greg Nesteroff, Nelson Star; posted Sep 16, 2013; updated November 30, 2014; http://www.nelsonstar.com/community/223963821.html. [includes photograph of Castlegar property in Castlegar, Ahascragh, County Galway, Ireland. Edward Mahon and the Naming of Castlegar, by Greg Nesteroff, B.C. Historical News, volume 31, number 1, pages 24-25. Getting to Know a Mahon, North Vancouver Museum & Archives Bulletin, March 2013, page 1; http://www.trailsintime.org/downloads/bulletin313.pdf. North Vancouver Land and Improvement Company fonds, http://www.memorybc.ca/north-vancouver-land-and-improvement-company-fonds [includes brief history of John and Edward Mahon]. “England and Wales Birth Registration Index, 1837-2008,” database, FamilySearch (https://familysearch.org/ark:/61903/1:1:2N8D-1H6 : accessed 28 March 2016), Edward Mahon, 1862; from “England & Wales Births, 1837-2006,” database, findmypast (http://www.findmypast.com : 2012); citing Birth Registration, Rotherham, Yorkshire, England, citing General Register Office, Southport, England. “England and Wales Census, 1871”, database with images, FamilySearch (https://familysearch.org/ark:/61903/1:1:VBZM-9SF : accessed 27 March 2016), Edward Mahon in entry for William V Ross Mahon, 1871. Marlborough College, Wikipedia article; https://en.wikipedia.org/wiki/Marlborough_College. “Canada Census, 1901,” database, FamilySearch (https://familysearch.org/ark:/61903/1:1:KHVJ-M67 : accessed 26 March 2016), Edward Mahon, D, Burrard, British Columbia, Canada; citing p. 2, Library and Archives of Canada, Ottawa. “New York Passenger Arrival Lists (Ellis Island), 1892-1924,” database, FamilySearch (https://familysearch.org/ark:/61903/1:1:JFHX-B66 : accessed 26 March 2016), Edward Mahon, 14 May 1905; citing departure port Liverpool, arrival port New York, ship name Cedric, NARA microfilm publication T715 and M237 (Washington D.C.: National Archives and Records Administration, n.d.). “British Columbia Marriage Registrations, 1859-1932; 1937-1938,” database with images, FamilySearch (https://familysearch.org/ark:/61903/1:1:JDDQ-F1V : accessed 26 March 2016), Edward Mahon and Lilette Caroline Julia Rebbeck, 26 Apr 1911; citing Vancouver, British Columbia, Canada, British Columbia Archives film number B11375, Vital Statistics Agency, Victoria; FHL microfilm 1,983,703. “Recensement du Canada de 1911,” database, FamilySearch (https://familysearch.org/ark:/61903/1:1:QV95-99N9 : accessed 26 March 2016), Edward Mahon, 1911; citing Census, Vancouver Sub-Districts 1-18, British Columbia, Canada, Library and Archives of Canada, Ottawa, Ontario; FHL microfilm 2,417,661. “Canada Passenger Lists, 1881-1922,” database with images, FamilySearch (https://familysearch.org/ark:/61903/1:1:2HLJ-4MM : accessed 27 March 2016), Edward Mahon, Sep 1911; citing Immigration, Quebec City, Quebec, Canada, T-4782, Library and Archives Canada, Ottawa, Ontario. 1921 Canada Census, Edward Mahon, Reference Number: RG 31; Folder Number: 18; Census Place: Ward 1, Vancouver Centre, British Columbia; Page Number: 16; Ancestry.com. 1921 Census of Canada [database on-line]. Provo, UT, USA: Ancestry.com Operations Inc, 2013. “British Columbia Death Registrations, 1872-1986; 1992-1993”, database with images, FamilySearch (https://familysearch.org/ark:/61903/1:1:FL2J-9BB : accessed 26 March 2016), Edward Mahon, 1937. “Funeral services for Edward Mahon, 75, pioneer business many of Vancouver, will be held in the Center & Hanna chapel at 2 p.m. on Tuesday. Rev. C.C. Owen will officiate. Mr. Mahon died Friday night after a brief illness. Honorary pallbearers will be J.W. McFarland, F.M. [Chaldecott], George H. Dawson and George Phillips, both of Victoria, John Pugh, Charles Loewen, Robert Dempster of Clayburn, Herbert Drummond, Col. J.S. Tait, R.W. Rolt, W.S. Buttar and G.H. Morden. Active pallbearers will be G.L. Edwards, D.W. Reeve, J.W. Manson, Richard Bell-Irving, R.D. Brewis and J.N. Nicholls. 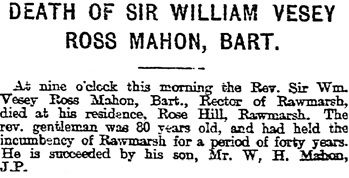 Mr. Mahon, who was sixth son of Sir William Vesey Ross Mahon, Bart., and Lady Mahon of Castlegar county, Galway, came to Vancouver in 1888, becoming a member of the early real estate and insurance firm established by his brother, John Mahon. Prominent in the life of the community, he was a member of the board of governors of the Genral Hospital and chairman of the board of governors of Tranquille Sanitorium. To him goes much of the credit for having the latter placed under provincial administration. He was a life member of the Vancouver Club and of the Vancouver Lawn Tennis Club, as well as a member of the board of trustees of Jericho Country Club. IN his earlier years, he was among the best of local cricketers, and did much for the sport here. Besides his long connection with the insurance firm of Mahon, McFarland & Procter [sic], he had large private holdings of real estate in Vancouver, North Vancouver and Victoria, also timber limits in Capilano valley and on Hollyburn ridge. He was interested in mining, having at one time been a registered assayer. The Slocan area also claimed his attention during its most active period of development. Up to the time of his death, he was chairman of the board of directors of North Vancouver Land & Improvement Co., Ltd., a position which he held for forty-five years. He held similar offices with Great Dominion Land Co. Ltd., Albion Land Co. Ltd., and the North Shore Press. “A long and active business career in Vancouver closed on Friday with the death in St. Paul’s Hospital of Edward Mahon, 1370 Burnaby Street, resident here 49 years and a pioneer in the insurance and real estate business. He was in his 76th year. Sixth son of Sir William Vesey Ross Mahon, Bart., and Lady Mahon of Castlegar, County Galway, Ireland, Mr. Mahon came to Vancouver in 1888 and immediately became a member of the firm of Mahon, McFarland & Mahon, which had been founded previously by his brother John and is now known as Mahon, McFarland & Proctor. Through his long connection with the real estate business Mr. Mahon . . . . had large personal holdings of realty in Vancouver, North Vancouver and Victoria, also timber limits in the Capilano valley and on Hollyburn. At one time he was actively interest in mining, having been a registered assayer and prominent in development in the Slocan, where his brother Gilbert was among the pioneer operators. Castlegar, near Trail, was named after the county seat of the Mahon family in Ireland. Mr. Mahon was chairman of the board of North Vancouver Land and Improvement Company for 45 years, and held similar offices with Great Dominion Land Co., Ltd., also the North Shore Press. Keenly interested in hospital work, Mr. Mahon was a member of the board of governors of Vancouver General Hospital, and chairman of the board of governors of Tranquille Sanitorium. His connection with the latter institution predated by many years its being put under provincial government administration, a move for which he was largely responsible. He was one of the pioneer members of the Vancouver Club and a life member for many years. He was among the organizers of the Vancouver Lawn Tennis Club, of which he was also a life member, and also was prominent in organization of the Jericho Country Club, of which he was one of the two first trustees. He was a keen cricketer in his earlier years, and retained his active interest in that sport until very recently. Born in Yorkshire, he was educated at first at Marlborough, famous English public school in Wiltshire, graduated from Oxford, and then studied law at Trinity College, Dublin, but although he passed his examinations as a solicitor never entered the practice of law. Mr. Mahon is survived by his wife, who is a daughter of the late James Reddeck of Victoria and by one son, Bryan Edward Mahon in Vancouver; two brothers, John and Gilbert; a sister, Mrs. H.T. Chambers in England; three nephews, Sir George Mahon, Bart, and Luke Mahon in Ireland and Denis MAHON IN England; one niece, Hon. Mrs. Croton in Ireland. Funeral services will be held in the Center & Hanna chapel on Tuesday at 2 p.m., Rev. Lt. Col. C.C. Owen officiating, and will be followed by cremation. Honorary pallbearers will be J.W. McFarland, F.M. Chaldecott, George H. Dawson and George Phillips of Victoria, John Pugh, Charles Loewen, Robert Dempster of Clayburn, Herbert Drummond, Col., J.S. Tait, R.W. Rolt, W.S. Buttar, and George H. Morden of North Vancouver. “England and Wales Birth Registration Index, 1837-2008,” database, FamilySearch (https://familysearch.org/ark:/61903/1:1:2NW8-QPF : accessed 27 March 2016), James Knight Rebbeck, 1848; from “England & Wales Births, 1837-2006,” database, findmypast (http://www.findmypast.com : 2012); citing Birth Registration, Marlborough, Wiltshire, England, citing General Register Office, Southport, England. “England Births and Christenings, 1538-1975,” database, FamilySearch (https://familysearch.org/ark:/61903/1:1:J99K-2MQ : accessed 27 March 2016), James Knight Rebbeck, 20 Oct 1848; citing OVERTON,WILTSHIRE,ENGLAND, reference ; FHL microfilm 950,268. “England and Wales Census, 1851,” database with images, FamilySearch (https://familysearch.org/ark:/61903/1:1:QKVN-VKYM : accessed 27 March 2016), James K Rebbeck in household of Caroline Knight, St James, Wiltshire, England; citing St James, Wiltshire, England, p. 24, from “1851 England, Scotland and Wales census,” database and images, findmypast (http://www.findmypast.com : n.d.); citing PRO HO 107, The National Archives of the UK, Kew, Surrey. “England and Wales Census, 1861,” database with images, FamilySearch (https://familysearch.org/ark:/61903/1:1:M7K3-39F : accessed 27 March 2016), James Knight Rebbeck in household of John Farmer, Warminster, Wiltshire, England; from “1861 England, Scotland and Wales census,” database and images, findmypast (http://www.findmypast.com : n.d.); citing PRO RG 9, The National Archives, Kew, Surrey. “Canada Census, 1901,” database, FamilySearch (https://familysearch.org/ark:/61903/1:1:KHVK-J3D : accessed 27 March 2016), James K Rebbeck, D, Victoria, British Columbia, Canada; citing p. 4, Library and Archives of Canada, Ottawa. “British Columbia Death Registrations, 1872-1986; 1992-1993”, database with images, FamilySearch (https://familysearch.org/ark:/61903/1:1:FL27-PNL : accessed 27 March 2016), James Knight Rebbeck, 1910; medical certificate of death: https://familysearch.org/ark:/61903/3:1:S3HT-D4N3-2Z?i=3239&wc=S62S-K68%3A1069395901%3Fcc%3D1538285&cc=1538285. “Well-Known Engineer Dies Suddenly; Late Mr. James Knight Rebbeck Had World Wide Reputation as Mechanical Engineer and Naval Architect,” Victoria Daily Colonist, September 3, 1910, page 2, column 3: http://archive.org/stream/dailycolonist53232uvic#page/n1/mode/1up. James Knight Rebbeck, funeral announcement, Victoria Daily Colonist, September 4, 1910, page 15, column 5; http://archive.org/stream/dailycolonist53233uvic#page/n14/mode/1up. James Knight Rebbeck, funeral description, Victoria Daily Colonist, September 7, 1910, page 7, column 5; http://archive.org/stream/dailycolonist53234uvic#page/n6/mode/1up. “BillionGraves Index,” database, FamilySearch (https://familysearch.org/ark:/61903/1:1:QJDL-PFGK : accessed 27 March 2016), James Knight Rebbeck, died 01 Sep 1910; citing BillionGraves (http://www.billiongraves.com : 2012), Burial at Ross Bay Cemetery, Victoria, Capital Regional District, British Columbia, Canada; https://billiongraves.com/grave/person/7140360. “Find A Grave Index,” database, FamilySearch (https://familysearch.org/ark:/61903/1:1:QVGM-DQTX : accessed 27 March 2016), James Knight Rebbeck, 1910; Burial, Victoria, Capital Regional District, British Columbia, Canada, Ross Bay Cemetery; citing record ID 113519295, Find a Grave, http://www.findagrave.com/cgi-bin/fg.cgi?page=gr&GRid=113519295. “Canada Census, 1901,” database, FamilySearch (https://familysearch.org/ark:/61903/1:1:KHVK-J36 : accessed 28 March 2016), Elizabeth Rebbeck in household of James K Rebbeck, D, Victoria, British Columbia, Canada; citing p. 4, Library and Archives of Canada, Ottawa. “British Columbia Marriage Registrations, 1859-1932; 1937-1938,” database with images, FamilySearch (https://familysearch.org/ark:/61903/1:1:JDZR-YQN : accessed 27 March 2016), Archibald Mceachran and Elizabeth Rebbeck, 20 Jun 1921; citing New Westminster, British Columbia, Canada, British Columbia Archives film number B12906, Vital Statistics Agency, Victoria; FHL microfilm 2,032,869. “British Columbia Death Registrations, 1872-1986; 1992-1993”, database with images, FamilySearch (https://familysearch.org/ark:/61903/1:1:FL2D-13Y : accessed 27 March 2016), Elizabeth Caroline D’Abbadie Mceachran, 1935. Skamania County Auditor, Marriage Records, 1905-2012 – Andrew Panian – Ida D Mceachran; http://www.digitalarchives.wa.gov/Record/View/099F153703BF9A065B21670484814F79; http://www.digitalarchives.wa.gov/DigitalObject/View/E67307C5C8D41F647E0A799CE967B21B (possible connection). “California, San Francisco Passenger Lists, 1893-1953,” database with images, FamilySearch (https://familysearch.org/ark:/61903/1:1:KXH3-WSD : accessed 27 March 2016), Archibald Dunerik Mceachran, 1933; citing San Francisco, San Francisco, California, United States, NARA microfilm publication M1410 (Washington, D.C.: National Archives and Records Administration, n.d.); FHL microfilm 2,381,081. “California, San Francisco Passenger Lists, 1893-1953,” database with images, FamilySearch (https://familysearch.org/ark:/61903/1:1:KXHQ-W9P : accessed 27 March 2016), Archibald Dunerik Maceachran, 1936; citing San Francisco, San Francisco, California, United States, NARA microfilm publication M1410 (Washington, D.C.: National Archives and Records Administration, n.d.); FHL microfilm 2,381,112. 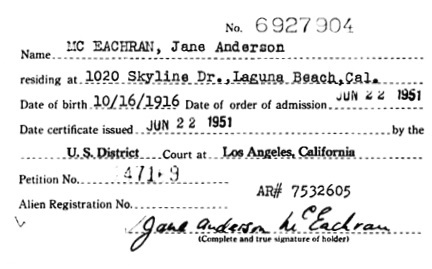 “California, San Francisco Passenger Lists, 1893-1953,” database with images, FamilySearch (https://familysearch.org/ark:/61903/1:1:KXHQ-W95 : accessed 27 March 2016), Jane Anderson Maceachran, 1936; citing San Francisco, San Francisco, California, United States, NARA microfilm publication M1410 (Washington, D.C.: National Archives and Records Administration, n.d.); FHL microfilm 2,381,112. “New York, New York Passenger and Crew Lists, 1909, 1925-1957,” database with images, FamilySearch (https://familysearch.org/ark:/61903/1:1:2423-Z42 : accessed 27 March 2016), Archibald Dunerik Mceachran, 1938; citing Immigration, New York, New York, United States, NARA microfilm publication T715 (Washington, D.C.: National Archives and Records Administration, n.d.). “New York, New York Passenger and Crew Lists, 1909, 1925-1957,” database with images, FamilySearch (https://familysearch.org/ark:/61903/1:1:2423-Z4K : accessed 27 March 2016), Irene Mceachran, 1938; citing Immigration, New York, New York, United States, NARA microfilm publication T715 (Washington, D.C.: National Archives and Records Administration, n.d.). “Hawaii, Honolulu Passenger Lists, 1900-1953,” database with images, FamilySearch (https://familysearch.org/ark:/61903/1:1:QV9Z-RB47 : accessed 27 March 2016), Archibald Dunerik Mc Eachran, 1939; citing Ship , NARA microfilm publication A3422 (Washington D.C.: National Archives and Records Administration, n.d.). “Hawaii, Honolulu Passenger Lists, 1900-1953,” database with images, FamilySearch (https://familysearch.org/ark:/61903/1:1:QV9Z-RB4W : accessed 27 March 2016), Jane Anderson Mc Eachran, 1939; citing Ship , NARA microfilm publication A3422 (Washington D.C.: National Archives and Records Administration, n.d.). “California, Los Angeles Passenger Lists, 1907-1948,” database with images, FamilySearch (https://familysearch.org/ark:/61903/1:1:KZQ8-2WF : accessed 27 March 2016), Archibald Mc Eachron, 1941; citing Immigration, ship name Matsonia Voy 78, NARA microfilm publication M1764 (Washington, D.C.: National Archives and Records Administration, n.d.), roll 107; FHL microfilm 1,734,711. “California, Los Angeles Passenger Lists, 1907-1948,” database with images, FamilySearch (https://familysearch.org/ark:/61903/1:1:KZQ8-2WN : accessed 27 March 2016), Jane Mc Eachron, 1941; citing Immigration, ship name Matsonia Voy 78, NARA microfilm publication M1764 (Washington, D.C.: National Archives and Records Administration, n.d.), roll 107; FHL microfilm 1,734,711. “California, San Francisco Passenger Lists, 1893-1953,” database with images, FamilySearch (https://familysearch.org/ark:/61903/1:1:KXHW-6W4 : accessed 27 March 2016), Jane A Or Irene Mceachron, 1941; citing San Francisco, San Francisco, California, United States, NARA microfilm publication M1410 (Washington, D.C.: National Archives and Records Administration, n.d.); FHL microfilm 2,381,157. “New York, New York Passenger and Crew Lists, 1909, 1925-1957,” database with images, FamilySearch (https://familysearch.org/ark:/61903/1:1:2H3P-K2V : accessed 27 March 2016), Archibald Mceachran, 1945; citing Immigration, New York City, New York, United States, NARA microfilm publication T715 (Washington, D.C.: National Archives and Records Administration, n.d.). “United States Social Security Death Index,” database, FamilySearch (https://familysearch.org/ark:/61903/1:1:JBQG-5PK : accessed 27 March 2016), Archibald Mceachran, Jan 1963; citing U.S. Social Security Administration, Death Master File, database (Alexandria, Virginia: National Technical Information Service, ongoing). “Find A Grave Index,” database, FamilySearch (https://familysearch.org/ark:/61903/1:1:QVGR-Y5VL : accessed 28 March 2016), Archibald Dunerik McEachran, ; Burial, Los Angeles, Los Angeles, California, United States of America, Forest Lawn Memorial Park (Hollywood Hills); citing record ID 132975994, Find a Grave, http://www.findagrave.com/cgi-bin/fg.cgi?page=pv&GRid=132975994&PIpi=105482237. “British Columbia Death Registrations, 1872-1986; 1992-1993”, database with images, FamilySearch (https://familysearch.org/ark:/61903/1:1:FLBJ-R1S : accessed 27 March 2016), Bertram Farmer Mceachran, 1973. Jane Anderson McEachran-Wilson-Gibson; https://www.geni.com/people/jane-anderson-McEachran-Wilson-Gibson/6000000024194105011; Death: (Date and location unknown); Immediate Family: Wife of Wilson; Mother of Victoria C. Wilson-Rathbun. “California Birth Index, 1905-1995,” database, FamilySearch (https://familysearch.org/ark:/61903/1:1:V27P-PFM : accessed 28 March 2016), Victoria Cheri Wilson, 24 Jul 1946; citing Ventura, California, United States, Department of Health Services, Vital Statistics Department, Sacramento. “United States Public Records, 1970-2009,” database, FamilySearch (https://familysearch.org/ark:/61903/1:1:QJXM-8JRG : accessed 28 March 2016), Vicki C Rathbun, Residence, Bakersfield, California, United States; a third party aggregator of publicly available information. “United States Social Security Death Index,” database, FamilySearch (https://familysearch.org/ark:/61903/1:1:JTVZ-B6B : accessed 28 March 2016), Victoria C Rathbun, 11 Jan 2009; citing U.S. Social Security Administration, Death Master File, database (Alexandria, Virginia: National Technical Information Service, ongoing). Funeral services for Jan. 30, By The Bakersfield Californian, Friday, Jan 30, 2009, http://www.bakersfield.com/news/2009/01/30/funeral-services-for-jan-30.html: No services: Victoria Cheri Rathbun, 62, Bakersfield, Jan. 11. Hillcrest Memorial Park & Mortuary. “Canada Census, 1901,” database, FamilySearch (https://familysearch.org/ark:/61903/1:1:KHVK-J3X : accessed 28 March 2016), Lilette Rebbeck in household of James K Rebbeck, D, Victoria, British Columbia, Canada; citing p. 4, Library and Archives of Canada, Ottawa. “Recensement du Canada de 1911,” database, FamilySearch (https://familysearch.org/ark:/61903/1:1:QV95-99NS : accessed 26 March 2016), Lilette Mahon in entry for Edward Mahon, 1911; citing Census, Vancouver Sub-Districts 1-18, British Columbia, Canada, Library and Archives of Canada, Ottawa, Ontario; FHL microfilm 2,417,661. 1921 Canada Census, Matilda [sic] Mahon in household of Edward Mahon, Reference Number: RG 31; Folder Number: 18; Census Place: Ward 1, Vancouver Centre, British Columbia; Page Number: 16; Ancestry.com. 1921 Census of Canada [database on-line]. Provo, UT, USA: Ancestry.com Operations Inc, 2013. “Leaving Vancouver shortly to live in Seattle, Mrs. Mahon hopes that civic officials will give a little more thought to Vancouver’s tomorrow. . . . Her husband and his brother John were members of the firm Mahon, McFarland and Mahon, later Mahon, McFarland and Procter, agents for the North Vancouver Land and Improvement Company, and Edward Mahon had a big hand in planning North Vancouver. . . . Daughter of a French mother, the late Mrs. A.D. McEachran, and an English father, the late Mr. John Knight Rebbeck, Mrs. Mahon had a head start on languages, and made further strides when she and her –born Mrs. Robert Dempster of Clayburn, were sent to France to study. Mrs. Mahon’s parents had met in Haiphong, Tonkin, where her mother had recently arrived from Paris to visit her brother and where Mr. Rebbeck, a naval architect, had gone from Hong Kong to deliver some boats he had designed. Mrs. Mahon was born in Macao, a Portuguese possession on the China Coast, and local officials sent a band to play God Save the Queen (Victoria) and the Portuguese national anthem in welcome to the golden-haired English baby, christened Lilette. His wife, who had just written her first book, a study of French China titled “The Home of the Dragon,” and his little daughter joined him here on Oct. 29, 1893. . . . Her sister was born in their home at what is now Twelfth and Main before Mr. Rebbeck went to Victoria as manager of the Albion Iron Works, and where he later became a consulting engineer. Mrs. Mahon’s only brother, Waller Rebbeck, a patent attorney with a chemical company in Midland, Mich., was born in Victoria. Mr. Rebbeck often went on business to Vancouver, and it was here that he met the dashing Irish bachelor, Edward Mahon, who had left Ireland where his family lived at Castlegar, Ahaseragh, County Galway, in 1890. Mr. Mahon was president of the Vancouver Club at that time, and sent engraved invitation to the annual New Year’s Eve Ball to the daughter of his friend Mr. Rebbeck. . . .
Mrs. Mahon didn’t see her future husband again until he came to see her off on the train when she and her sister left for Brittany. The girls were to be away for two ears, but returned in 12 months because of their father’s sudden illness. After Mr. Rebbeck’s death, his widow and his eldest daughter came to Vancouver, where Mr. Rebbeck ran the tea house at Capilano Suspension Bridge. Mr. and Mrs. Mahon were married in the spring of 1911 and resided in the Seaton street house which Mr. Mahon had made a favorite rendezvous for Vancouver society. . . .
“Washington Death Certificates, 1907-1960,” database, FamilySearch (https://familysearch.org/ark:/61903/1:1:N313-89L : accessed 26 March 2016), Lilette Julia Caroline Mahon, 16 Apr 1956; citing Mercer Island, King, Washington, reference 7009, Bureau of Vital Statistics, Olympia; FHL microfilm 2,033,618. “Funeral services for Mrs. Edward Mahon, well known in Vancouver’s public life for many years and former city School Board chairman, will be held in Seattle Thursday. Mrs. Mahon, who left here in 1953, died Monday. She was 66. A keen student of civic government, Mrs. Mahon served on the School Board from 1930 to 1936. She was an unsuccessful candidate for City Council and ran in the federal Vancouver Centre riding for the Reconstruction Party of Hon. H.H. Stevens. She was a past president of the B.C. Parent-Teacher Federation and the Vancouver Parent-Teacher Council. In 1936 she was elected president of the B.C. School Trustees Association. When she was past 50, Mrs. Mahon enrolled in the Vancouver School of Art and took a full four-year course. She graduated in 1947. Years earlier, she had been a member of the delegation that waited on the School Board asking formation of the school. As a child in Victoria she was a pupil of the late Emily Carr, Canada’s noted artist. Born Lilette Rebbeck in Macao on the China cost, Mrs. Mahon came to Canada as a child. “British Columbia Death Registrations, 1872-1986; 1992-1993”, database with images, FamilySearch (https://familysearch.org/ark:/61903/1:1:QK6P-KMHV : accessed 27 March 2016), Gundrid Minna Dempster, 1992. Time Windows: A story behind a photograph; by Walter Volovsek – Castlegar News; March 8, 2016; http://www.castlegarnews.com/opinion/371458731.html. Includes photograph of a young Bryan Edward Mahon and two other children: Margaret Woodroofe and Jim Virtue, as well as details of the Mahon family. 1921 Canada Census, Bryan Edward Mahon in household of Edward Mahon, Reference Number: RG 31; Folder Number: 18; Census Place: Ward 1, Vancouver Centre, British Columbia; Page Number: 16; Ancestry.com. 1921 Census of Canada [database on-line]. Provo, UT, USA: Ancestry.com Operations Inc, 2013. “United States Public Records, 1970-2009,” database, FamilySearch (https://familysearch.org/ark:/61903/1:1:2M7W-VW3 : accessed 26 March 2016), Bryan E Mahon, Residence, Mercer Island, Washington, United States; a third party aggregator of publicly available information. “United States Social Security Death Index,” database, FamilySearch (https://familysearch.org/ark:/61903/1:1:VM7Z-VZF : accessed 26 March 2016), Bryan E Mahon, 10 Nov 2005; citing U.S. Social Security Administration, Death Master File, database (Alexandria, Virginia: National Technical Information Service, ongoing). “United States, GenealogyBank Obituaries, 1980-2014,” database with images, FamilySearch (https://familysearch.org/ark:/61903/1:1:QK4K-SG3L : accessed 26 March 2016), Bryan E Mahon, Washington, United States, 20 Nov 2005; from “Recent Newspaper Obituaries (1977 – Today),” database, GenealogyBank.com (http://www.genealogybank.com : 2014); citing Seattle Times, The, born-digital text. “United States Public Records, 1970-2009,” database, FamilySearch (https://familysearch.org/ark:/61903/1:1:2M7W-VW9 : accessed 26 March 2016), Marolyn E Mahon, Residence, Mercer Island, Washington, United States; a third party aggregator of publicly available information. “United States Public Records, 1970-2009,” database, FamilySearch (https://familysearch.org/ark:/61903/1:1:QJ5G-PT14 : accessed 26 March 2016), Marilyn E Bryan, Residence, Mercer Island, Washington, United States; a third party aggregator of publicly available information. “Volovsek pays tribute to a key figure in Castlegar’s history,” Castlegar News, Aug 19, 2012, http://www.castlegarnews.com/community/166721576.html [includes photograph of Walter Volovsek and Marolyn Mahon]. “United States Public Records, 1970-2009,” database, FamilySearch (https://familysearch.org/ark:/61903/1:1:2M7W-V8T : accessed 27 March 2016), Ross M Mahon, Residence, Renton, Washington, United States; a third party aggregator of publicly available information. “United States Public Records, 1970-2009,” database, FamilySearch (https://familysearch.org/ark:/61903/1:1:QJFL-RDZJ : accessed 27 March 2016), Ross M Mahon, Residence, Mercer Island, Washington, United States; a third party aggregator of publicly available information. “United States Public Records, 1970-2009,” database, FamilySearch (https://familysearch.org/ark:/61903/1:1:2MW3-Y4S : accessed 27 March 2016), Lilette Mahon Player, Residence, Woodinville, Washington, United States; a third party aggregator of publicly available information.